I have grand plans for these brownies. In fact, I wasn’t even going to share them as-is because they are just a stop along the way to potential greatness. But then I tried one and, well, let’s just say you need these in your life. It would be cruel of me to not share these immediately. This is just the beginning for these babies, but while you wait for what’s coming, make a batch of these delicious (and oh-so-easy) brownies. They’re just like box-mix brownies but better. Which I didn’t think was possible, because I am total box-mix brownie lover. 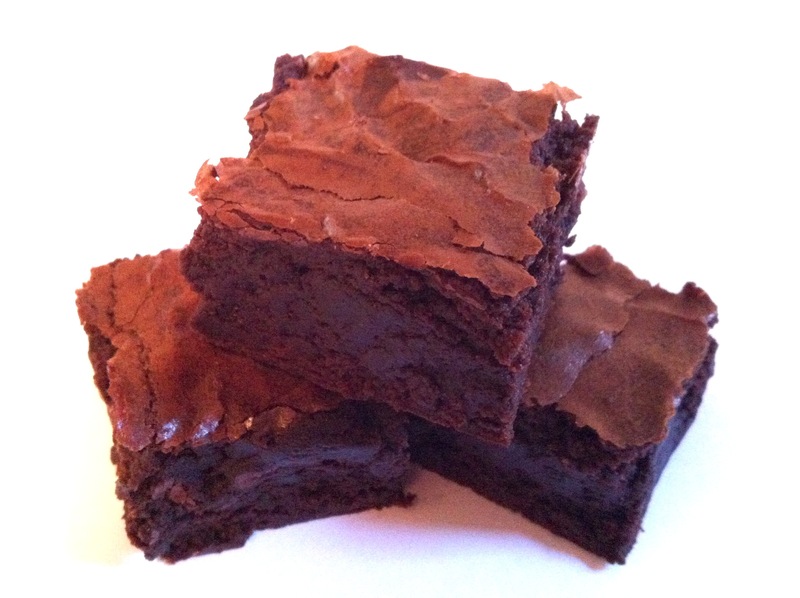 But I think this could convert even the biggest box-mix brownie fan: they have that perfect moist, dense texture with an incredible rich cocoa flavor. And best of all, start to finish takes less than an hour. What are you waiting for? Get baking! Recipe (barely adapted) from Smitten Kitchen, which Deb adapted from Alice Medrich’s Bittersweet. 1. Preheat oven to 325 F. Push a sheet of parchment paper (or aluminum foil) into an 8×8-inch square baking pan; it won’t stay very well, but that’s fine – just make sure the edges and bottom are all covered. When you add the batter later, it’ll push the parchment paper into place. 2. Combine the butter, sugars, cocoa, and salt in a medium bowl (heat-safe) and microwave for 30 seconds. Stir together gently until as well-mixed as you can get it, then microwave an additional 15 seconds. Stir together until thick and completely mixed. The batter should be warm to the touch; additional, short bursts of microwave time (don’t burn it!) may be necessary to get the batter warm. 3. Stir in vanilla extract then add eggs one at a time, stirring vigorously. When the batter is shiny and well-mixed, add the flour. Stir until it’s all mixed in, then beat vigorously for 40 strokes (incorporating air gives your brownies some “lift” and ensures they aren’t too flat/dense). 4. Pour into the parchment paper-lined pan and spread evenly. Bake for 30-35 minutes, until a toothpick comes out just slightly moist with batter. 5. 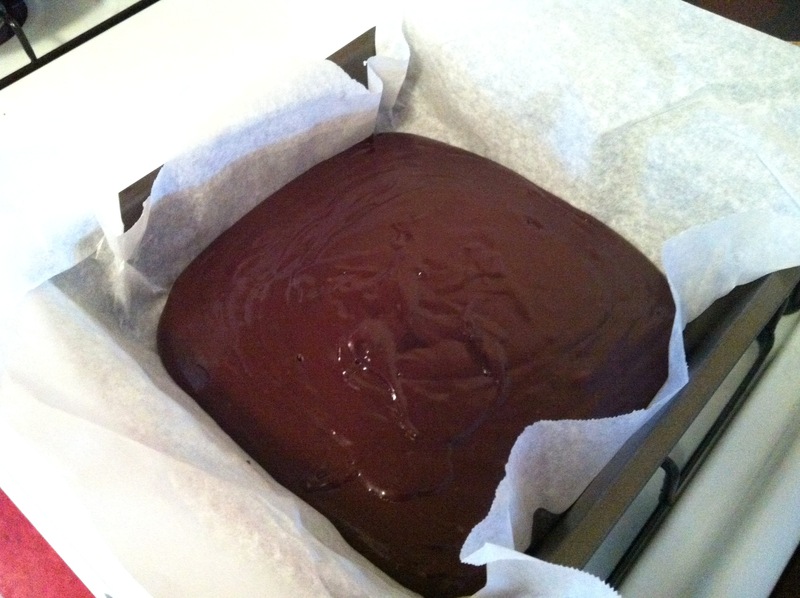 Cool completely, then lift the paper + brownies out and cut into squares. Easy, right?! Enjoy! If you leave extra parchment paper hanging off the sides, it’ll be a cinch to remove the brownies from the pan later – simply lift out!